I've made no bones about my support of Rich Rodriguez. Since day one, I've been firmly in his corner. I like his attempted overhaul of an albatross of a program, his scrappy mentality, and most of all his offense. I like Denard Robinson and Vincent Smith. I like that every player that has played for him says that he's a wonderful coach and has helped prepare them for the next level. I like the Tao of Barwis and the idea that someone on Michigan's coaching staff owns wolves. Those who say there wasn't any progress made during Rodriguez's tenure are simply wrong. Three years ago, he inherited a team that lost to Toledo. Whose starting quarterback--at Michigan, no less--was a walk-on. The only reason it seems like this program hasn't made any progress is because the dreck he took over has been put light years in the rear view mirror. Whether or not Michigan should've ever gone 3-9 is another argument altogether, but we knew what we were getting when Michigan hired Rich Rodriguez, and frankly, he delivered. Ultimately, that wasn't enough. A doomed marriage from the start, Michigan's fanbase was arrogant, petulant, and downright ignorant in its division and rejection of his hiring. At what other school can you imagine such dissidence simply through the hiring of a rising-star coach with a proven track record? Rodriguez wanted to change Michigan's culture into a program of the future when it was clear that the vast majority of the fanbase was too stupid to even imagine it. 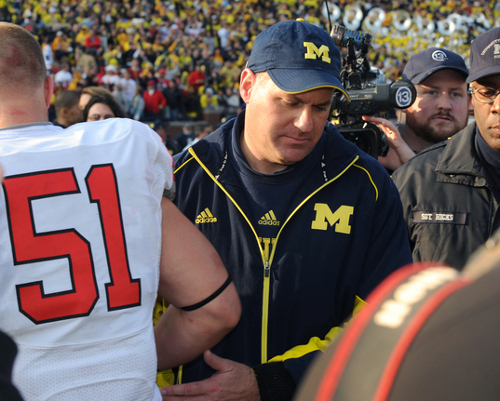 There were scandals and losing seasons and a blowout bowl loss, but I will remember Rich Rodriguez's time at Michigan fondly. My four years at Michigan were spent with the last four of the Carr era. Even then, though it wasn't quite as transparent, it was clear Michigan was a program stuck in idle. My malaise had already started to congeal by my senior year when Michigan lost the season opener to Appalachian State. When I was leaving the stadium and everyone was swearing and cursing the heavens, the only thing I said was, "If you're going to ruin my senior year, you might as well do it in week one." The last regular season game we played was The The Game and I just assumed that heartbreak was destined for my senior year as well. A friend of mine said to me yesterday, "The real problem with this is that now, Michigan won't be a national power for at least two or three more years." But frankly, I haven't been a tried-and-true Michigan fan long enough to ever remember them being a legitimate national power. My love of the program didn't really start until I went to school there. Since then, Michigan is winless against Ohio State and has had approximately one season of national relevance. The rest has been, well, just OK. That Michigan is entitled to national relevance is not something that computes with me, which is very likely something that makes me less angry and embittered toward Rodriguez. Today, the coaching search begins with Jim Harbaugh likely out of the picture. It's a happy day for Ann Arbor. It's a sad day for me. "Michigan's fanbase was arrogant, petulant, and downright ignorant in its division and rejection of his hiring"
Perfectly put. Unfortunately, most of the fanbase (let alone the media) is too arrogant, petulant, and downright ignorant to realize as much. If this ends up being true, I feel for Rodriguez as well. I think he's a good coach and seems to be a good guy, but this just didn't work. I think you're brushing off the 3-9 a little too easily. "He inherited a team that lost to Toledo" is an interesting statement that seems to absolve him of his responsibility in that. Rodriguez is a good guy, but the failures that seem to be costing him this job (two straight missed bowls and historicly awful defense) are on him, not on the fan base.